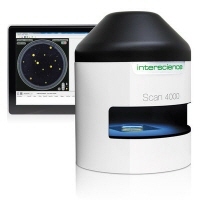 Scan 4000, automatic HD colour colony counter is adapted to all petri dish sizes and all media. Its indirect lighting system ensures great user comfort, high accuracy and excellent reproducibility. In compliance with CFR 21 part 11, EUCAST, CA-SFM. ISO 7218, ISO 4887-2 standards.